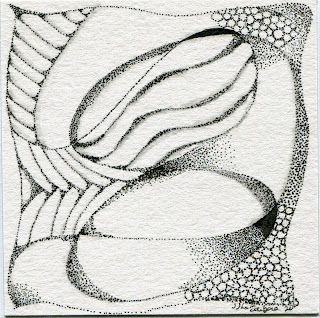 This week the challenge that Laura put forward is Pointillism. I confess that I have never tried this style of drawing before, or at least, not that I can remember. I guess maybe I have as the tangle pattern Rain Dotty is pointillism. However, I have not tried to create a whole piece of art using just this style. I really focused on the method here. Trying to play with the dots to show more depth in some areas while little in others. I ended up doing two for this week. First I used an older micron on a square of watercolor paper. I followed Laura's example a bit and kept things non-tanglely at first but later added more defined pattern. After I was done, I went back and added a little pencil for shade in a few spots. After I was finished, I found more to the tile than I thought there was. Some of the sections, blend one into the other to create a curved look that I certainly didn't plan. As my teacher in college would say, it was a "happy accident". Next I was drawn to give this method a try on canvas. I took a blank black canvas board I have and used white oil pen with a white charcoal pencil for shade. This one was really abstract. I just started tapping away over a minimum of pencil string and this is what I came up with. It reminds me of a shoe. I'm not sure why but it does. I am pleased with how it turned out. What is it? Who cares? 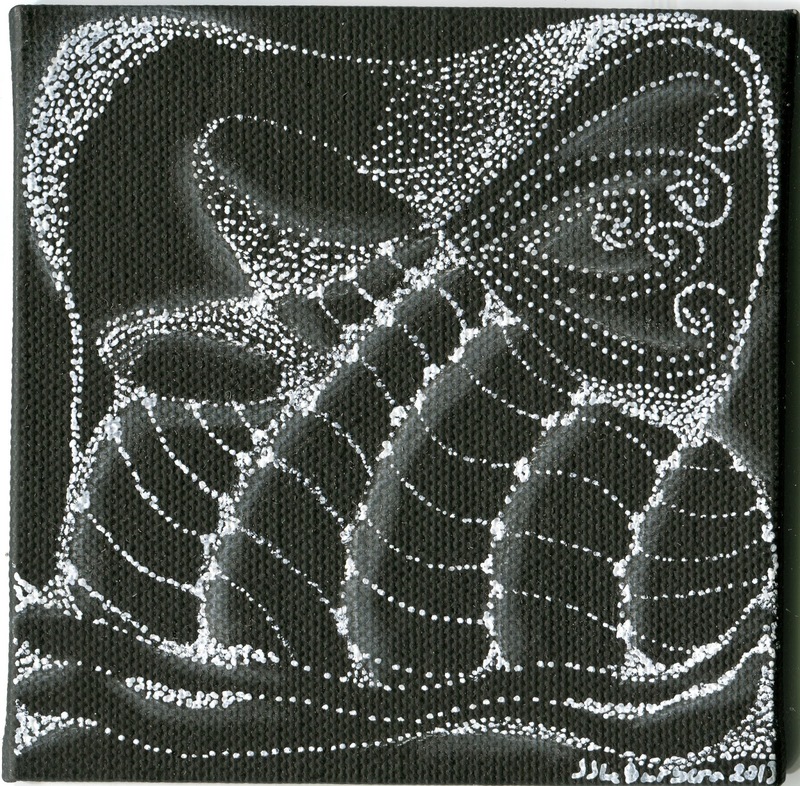 I will certainly explore pointillism more and keep it in mind while working on my pieces. Beautiful work in both tiles. Lovely works. Your "accidents" made me happy, too. You did very well with both of them. Both tiles are lovely examples of pointillism! Inspiring! Awesome I am new to zentangle. Love it, so relaxing. Love your work. I'm also new to shrinking, lol. I love art in any form.